Yesterday I shared with you that I had the privilege of appearing on the television show Craft Wars with my good friend Kathleen. 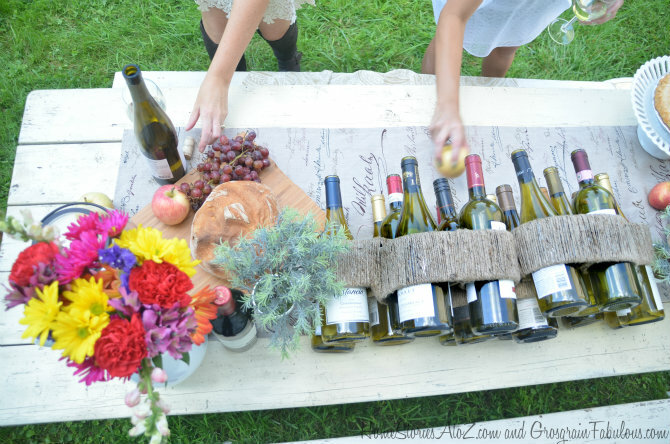 We were issued the challenge of making a “Thanksgiving Wine Rack” in one hour using some of the following materials: pie tins, acorns, silverware, turkey basters, footballs, and craft supplies from the craft closet. Kathleen came up with a GENIUS design plan. I am not a math girl, and this baby requires some quick math to pull off. 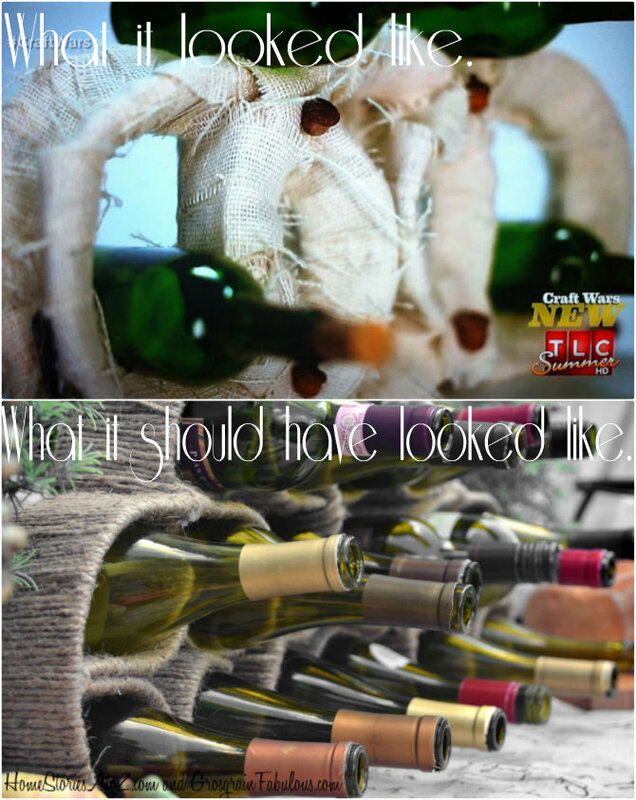 On the show, our original idea was to wrap the wine rack in rope or twine—but from all of the yarn wreaths and jute wrapped decor I have created over the years I just knew there was no way we would have enough time. Our second idea was to cut strips of burlap and twist the strips as we went along to create a “braided” look. This actually looked kind of cool but again…no time! So the burlap just had to be wrapped around in strips. I have crafted with burlap MANY times before, and I’ve never worked with burlap that frayed so much. 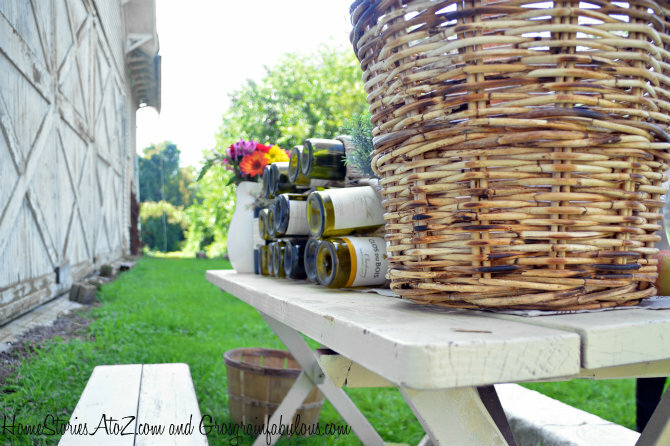 This stuff was ridiculous and our wine rack was a big craft fail. But Kathleen’s idea was a fantastic one, so we wanted to recreate it for you just in case you want to try your hand at making your own! 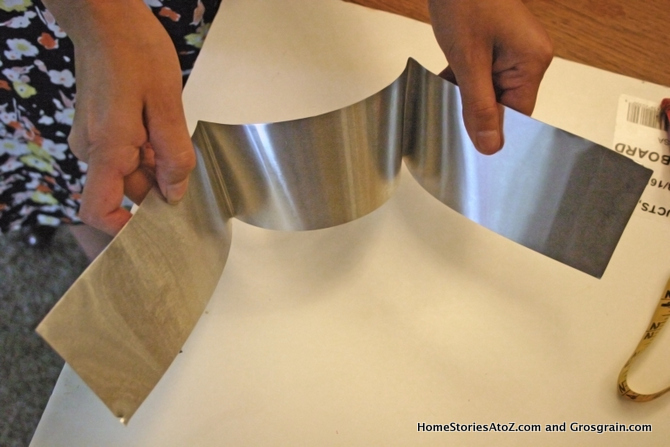 Instead of pie tins in the list of supplies you will see aluminum flashing. 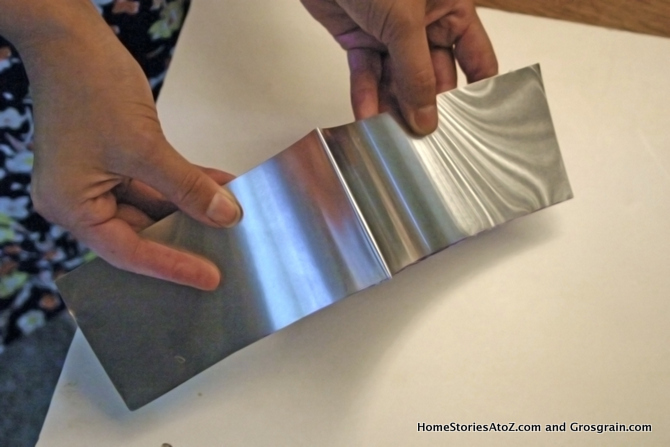 Roof flashing is so much easier to work with than pie tins and will give you a much cleaner end result! We didn’t think you’d mind *wink*. Scissors that will cut through metal. Wire snips will work. Your flashing is currently 14 inches wide and 10 feet long. You want to cut the entire thing in half lengthwise so that you’ll have two 7″ wide x 10′ long pieces. After you’ve cut your flashing in half, take your tape measure and scissors and cut your flashing into five 30” long pieces. Now put those in a pile and maybe slap a sticky note on them so you don’t forget their size! 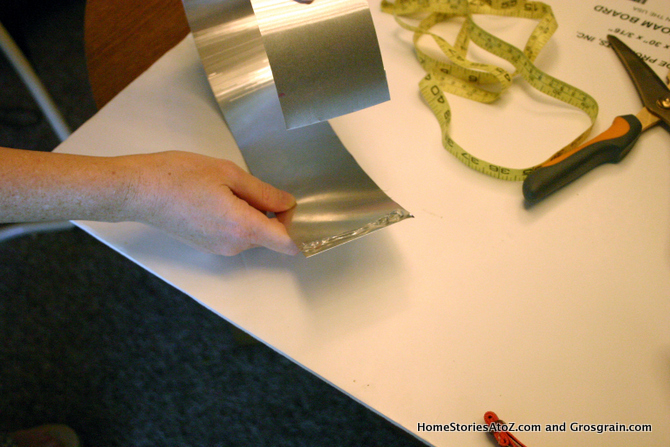 Then cut three 14” long pieces (pile and sticky note) and then cut two 21” long pieces (slap on a sticky). Take your FIVE 30 inch long pieces and grab your FlashMate glue. 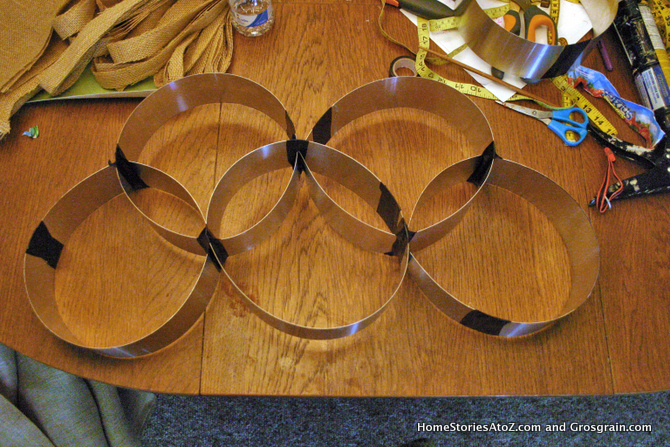 For each 30 inch long strip you will glue the ends together to create a circle. 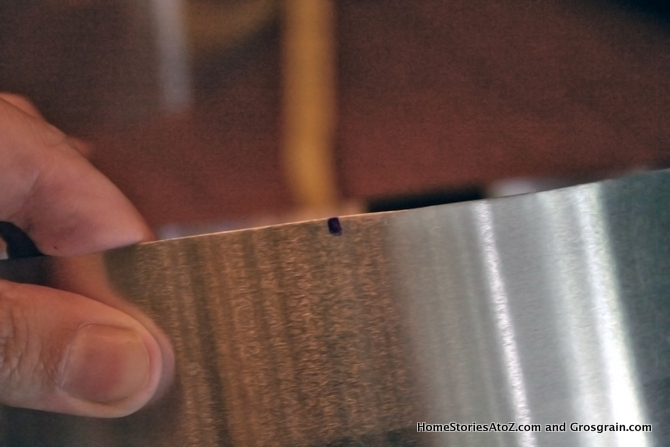 Add a long strip of glue to one end and glue both ends together, 1” deep. Your circle should now be 28” in circumference. Repeat this step until all five circles are complete. 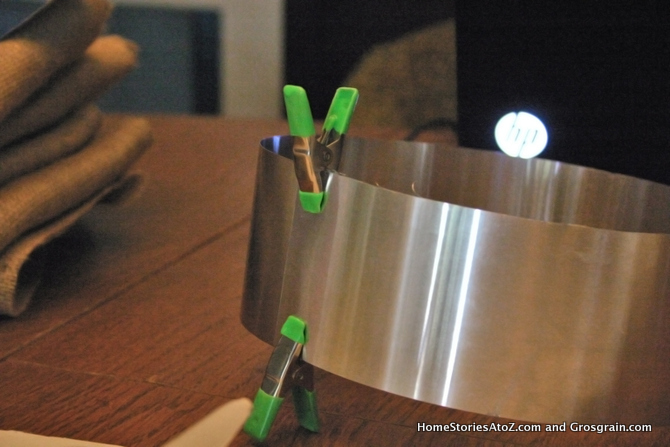 Add two metal clips to the ends to hold while the glue dries. 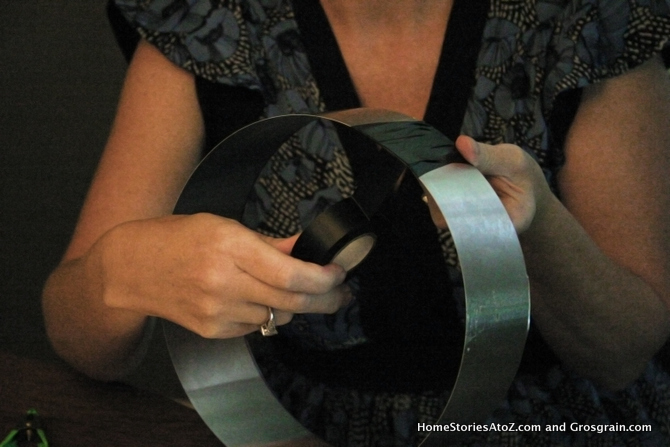 If you want to reinfornce the metal ends, use electrical tape and wrap around where the ends meet. The glue is sturdy but it takes a long time to dry and we didn’t want any surprises later on with the rack falling apart! Once all of your glue is dry you will have five 28 inch circles. You are now ready to connect these babies in an Olympic type circle! Grab those five circles and a marker and make a little mark every 7”. 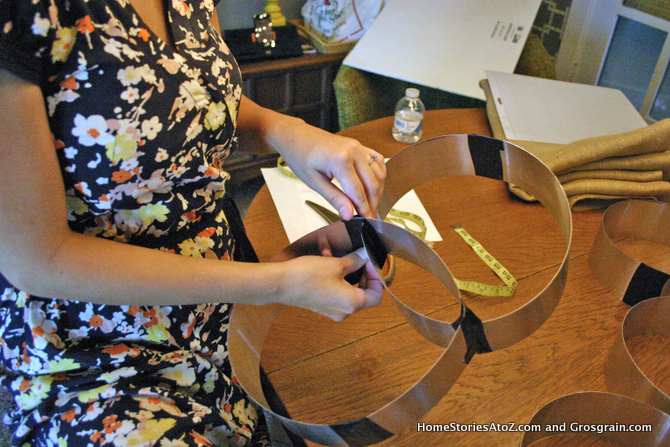 Take three circles and using your metal shears make slits at three of the marks you made. Leave ¾” of an inch uncut. Take two circles and make slits at two of the marks you made. (For the two circles, the slits should be at marks that are next to each other, not across from each other). This is complicated and very mathy but look ahead at the picture below Step 6 to get an idea of where you need to cut the slits on your circles. 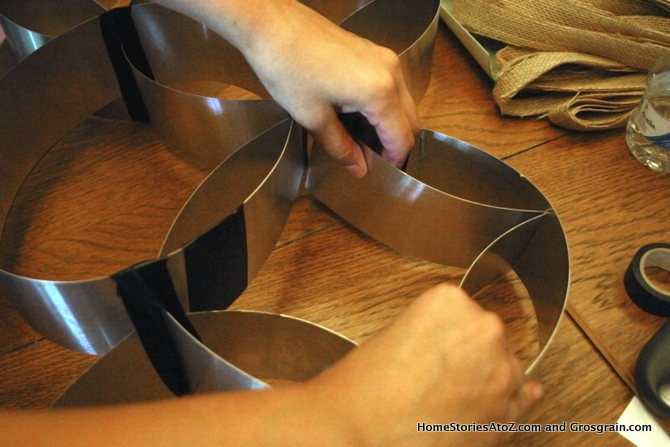 Slide the circles together by interlocking the slits you just made in Step 5. Reinforce all of the slits with electrical tape. Now you are ready to fill in the circles with some decorative flashing that will make this wine rack look like a geometric wonder! 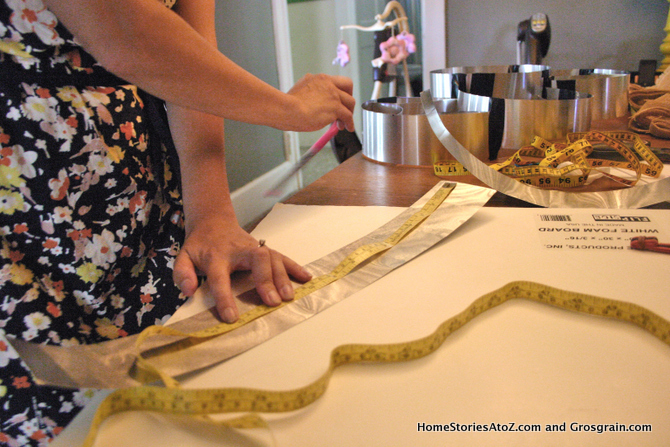 Grab your two 21″ pieces, your tape measure, and marker and again make a little mark every 7”. 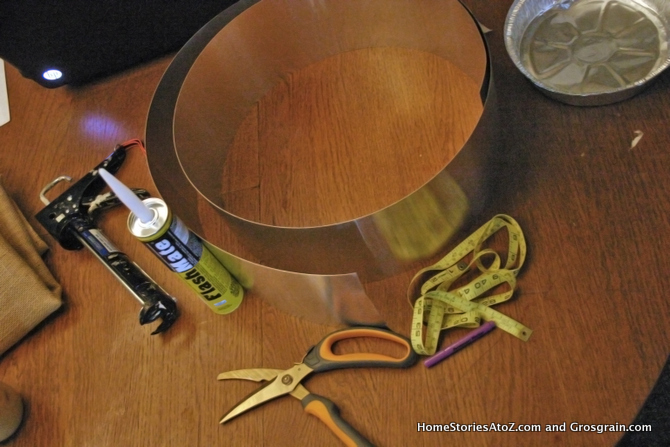 Take your 21” pieces and bend the flashing in a “W” shape at each of the marks. Take your three 14” pieces and bend them each in half. Place your 14” pieces on top and in the bottom/middle circle. Reinforce with electrical tape. Place your 21” “W” pieces in the left and right bottom circles. Reinforce with electrical tape. 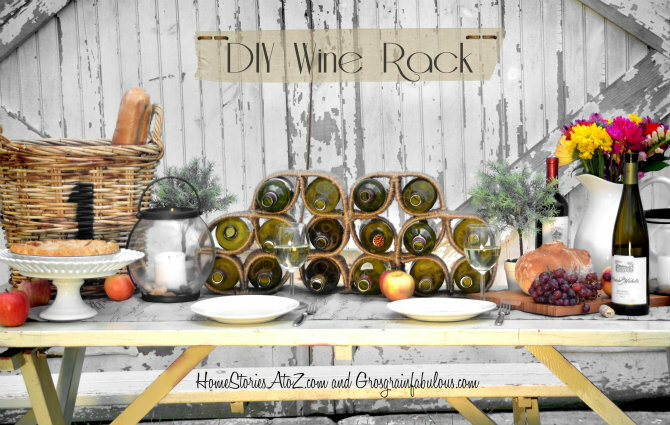 Do a little dance my friend because you just made a wine rack!! It will feel flimsy. This is on purpose. 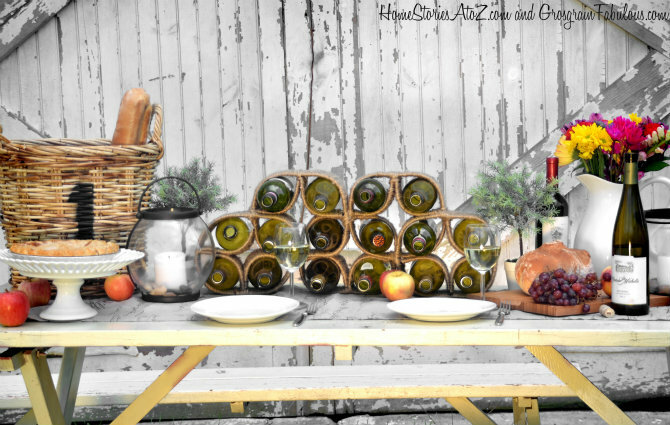 The wine rack needs to flex to fit all of your wine bottles. If you have every made a yarn wreath you KNOW how long this will take. 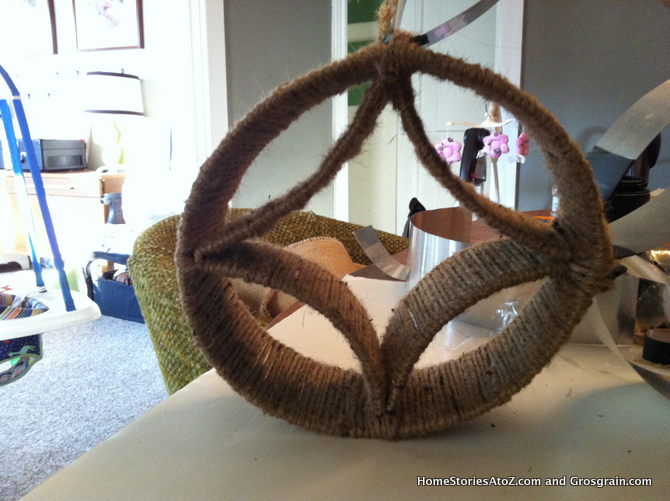 Wrap your entire structure with jute twine and hot glue if you dare. You could also wrap it in fabric strips or thick ribbon if you’re not willing to do all of that wrapping. 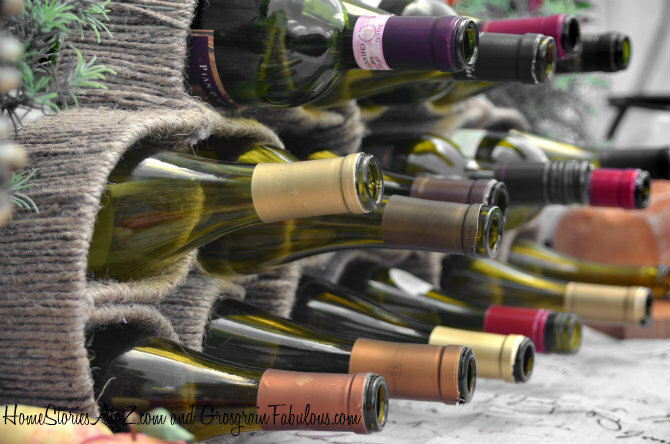 When you’re done, your wine rack will hold 16 bottles of wine. Of course we had to redeem ourselves after that awful craft fail, so Kathleen and I made a celebration out of the occasion by throwing our own little wine party! I staged the photos at an old barn in our area. I LOVE this old barn! If you remember my family photos from last year, we took them at this location as well. A few more gratuitous shots of our hard labor! Cheers girl! We might not have moved on during our episode of Craft Wars, but Kathleen and I certainly can accomplish some beautiful projects together! Just not in one hour. LOL! 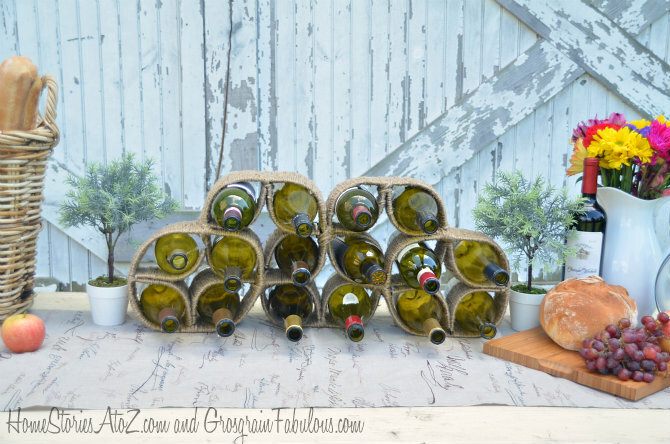 I hope you’ll try your hand at making our wine rack! And if not, I hope you’ll at least stay and enjoy some wine :). Beth I absolutely love the wine rack and the photo shoot is gorgeous but what I am loving so much is that dress!!!! It looks very anthro-esque:) wherever did you get it, I’m obsessed? and btw you make it look amazing! Glad you asked Kelly! Check back for a Fashion Friday post in a few where I tell you all about the dress! Redemption! 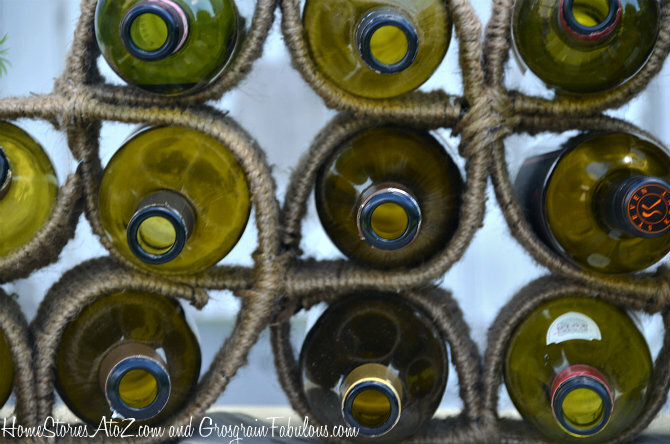 Love the wine rack. It looks gorgeous. BTW – Can I have that barn in the background. It’s totally swoon-worthy! I know! I am in love with that barn too :). This is so gorgeous! I LOVED your vision on Craft Wars and I’m so delighted that you did a re-do! Simply fabulous! Her vision was an awesome one. Just wish we could have magically pulled it off in an hour! Absolutely brilliant, girls. And, beautiful! Ah, that was you!!! I think you did a fantastic job with the time you were given, 1 hour must be so hard to accomplish anything in. Sometimes I sit down at my craft table and 2 hours goes by before I realize I’m on step 1 of 20 on whatever it is I’m working on! Nice redemption on the wine rack, it’s gorgeous. Thanks Leeann and yes that was the quickest hour EVER! Nice work! As much as I’ve enjoyed craft wars, I feel like they’re perpetuating the “crafters” misconception that we all use stupid materials and make junky stuff. I really wish they’d give you a realistic time frame and some time to show everyone that with a little time and creativity you can really make great stuff out of nothing, but instead they give you a bunch of junk and 1 hour and expect HUGE things. Knowing that all of you bloggers are capable of amazing stuff, it’s hard to watch the show and not get frustrated! 🙂 Either way, love this craft! You had an amazing experience and a lot of guts to go on the show! Be proud! I agree Abbey. But the other teams were able to come up with some pretty cute wine racks in that amount of time so we just didn’t quite estimate our time well enough. It’s really stressful to think, craft, have to talk through it all and be taped. I have a whole new appreciation for those who are on Design Star and other reality shows. You guys were so adorable! I loved how you kept smiling through it all. And that new and improved one came out beautiful! Thanks girl! Our goal beforehand was to do our best and fail gracefully if it came to that. Look what you can accomplish when using the right ingredients and not being under on a crazy time crunch 🙂 Gorgeous photos. Kudos to you both for putting yourself out there! Thanks Shannon. Amazing what some extra time will do for one’s ability to create, eh :)?